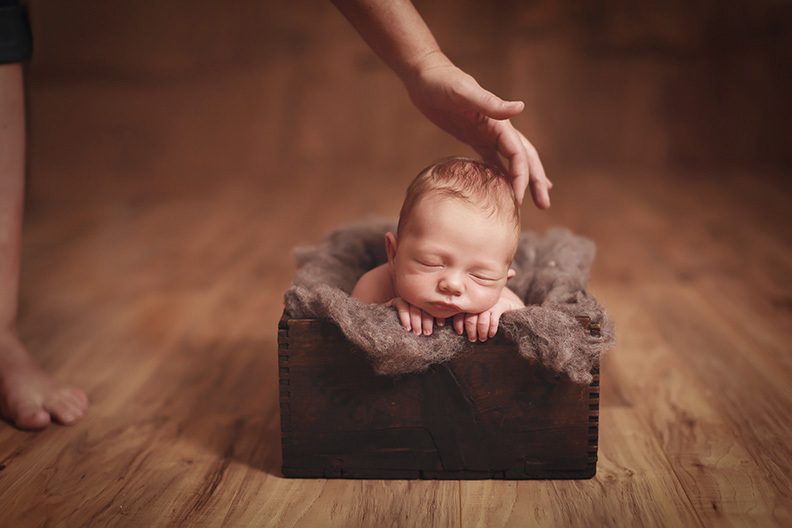 The newborn posing business has taken the US by storm, and is growing even bigger. 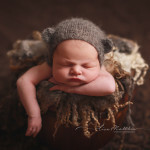 I’ve been a newborn photographer for 6 years now, and whilst I am constantly trying out new ideas and creative ways to pose babies, I’ve seen and heard of some really scary practices when posing fragile newborns. I love to take the shot where baby looks perfectly balanced on an old log or in a hammock, the perfect pose…but it’s really important to never compromise the safety of a baby. In such a competitive market, I understand the desire photographers have to keep our techniques a secret. However, because of the deep trust environment needed in newborn photography, I feel that it is more important to be transparent and share than it is to compromise a babies safety. 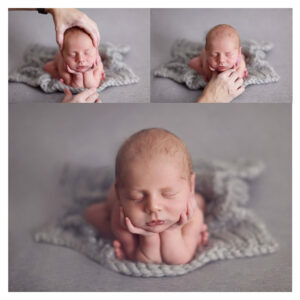 Even if only one baby becomes injured due to dangerous posing, it would be devastating to the family as well as to the whole newborn photography profession. To be honest, it is possible to balance a baby’s head in its hands for a few seconds, to balance a baby on a bench for a few minutes or to hang a baby from a branch… but ‘why would you?’ These poses are simple to do using composite images (composites are multiple images merged together through editing). The baby being photographed never needs to be put in a position where an accident could happen (because they do, that’s why they are called accidents). I would like to share some of my own posing methods with you. Firstly, I always use a spotter (also known as an assistant). She stays at all times right next to the baby to make sure he/she is safe. Even newborns can push themselves forward and roll. 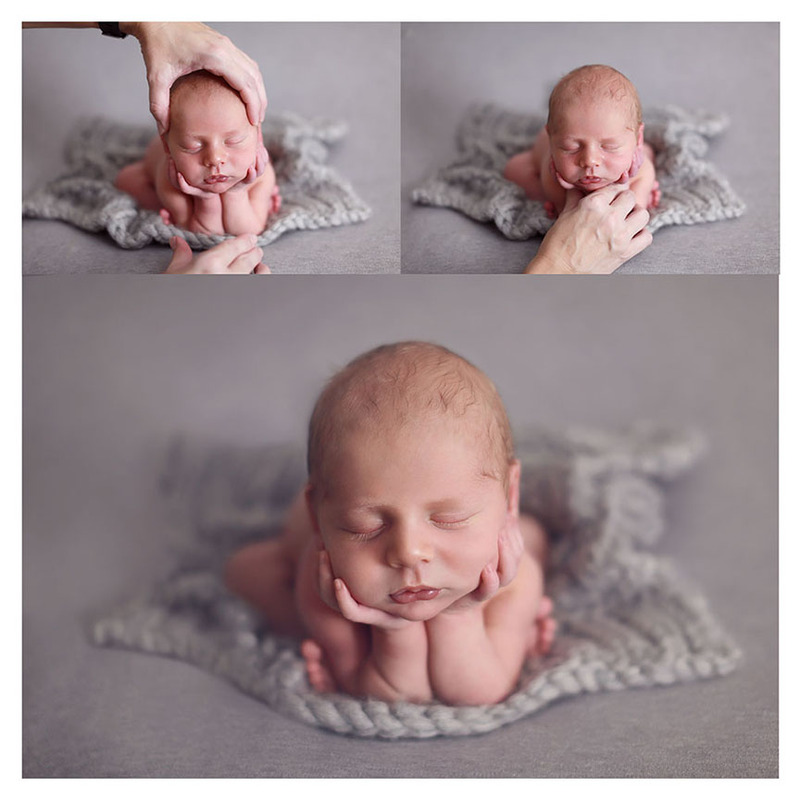 When positioning a baby into the pose where baby’s head is resting in his/her hands (also known in the industry as the ‘froggy pose’), I use two images. My assistant keeps their head supported and I merge the two images together in Photoshop for the final image. The image looks perfect and baby was never at risk of getting hurt. For my ‘hanging shots’, my assistant holds baby. She raises him/her just a few inches off the beanbag for a few seconds. 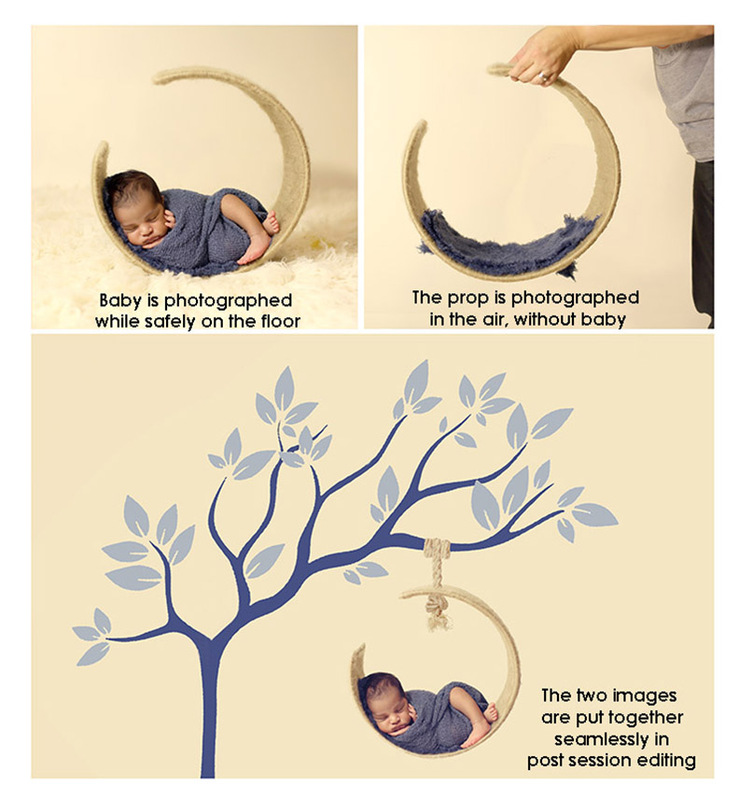 The final image looks like baby is hanging from a branch feet above the ground… but now you know how safe they really were. I have heard of photographers who tie baby in a sling to a branch. If its your baby being photographed, make sure there is a bean bag underneath, and that there is an adult (other than the photographer) to hold baby and keep them safe. (I do not recommend that baby is ever suspended more than a few inches above the bean bag). When photographing a basket or bucket shot, I always line the inside with soft fur and fabric. The area where baby’s hands/arms or head makes contact with the prop, I pad with something soft. My assistant’s job is to sit close to baby while I photograph. She makes sure baby doesn’t throw his/her head back, or move. She supports baby’s head when needed, and keeps her eyes on baby 100% of the time during the shots. There are many other things to be mindful of when photographing newborns. Safety is always the number one concern with these precious little lives. Ultimately… Listen to baby, they will tell you what they need.